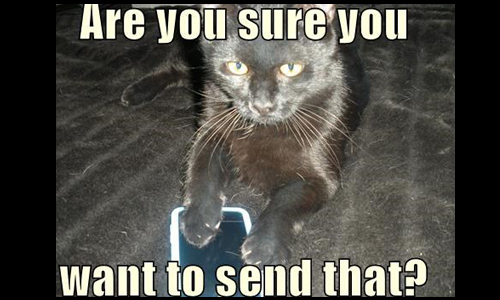 Have you ever regretted sending a tweet? In this week’s episode, we share the Mayor’s answer, and like the good politician he is, he says there was no single tweet he regretted. However, he did mention he regretted getting in to long conversations with people who he knew wouldn’t change their mind, conversations that belabor a point and don’t help anyone. Kristine and Julia talk about our response to the Mayor’s answer, the psychology of communicating and the questions you should ask when communicating with a non-respective audience. But we want to hear from you, have you ever regretted sending a tweet? How did you react? Did you delete the post? Apologize? Share your comments below, or on our Facebook Page, or on our Google+ page, or in our LinkedIn group, or on Pinterest, or send us an email at youngprpros@gmail.com, or send us a message on Twitter @youngprpros, @kristinedarbell or @kentjulia. This entry was posted in Young PR Pros podcast and tagged communications, cprs ottawa, cprs ottawa gatineau, jim watson, julia kent, kristine d'arbelles, politics, PR, regret tweeting, social media mistakes, young pr pros, young professionals, young pros by Kristine D'Arbelles. Bookmark the permalink. As a young public relations student, Twitter is a dangerous place. If a PR professional is using Twitter to share great content and connect with other people then it can be a great tool. Especially as a young pro, Twitter can be a great place to start building casual relationships with professionals. The dangerous part of Twitter is that it only takes 140 characters to ruin a reputation. Though it is easy to make those mistakes, I like that the mayor pointed out that responding quickly is important. I do not have a huge following on social media yet, but I always like to think before a tweet. If you have to stop and think about the quality of a post, then you probably should not share it. This podcast gave out many great tips that I will be sure to use in the future! Thank you! Thanks for sharing your comments. As young professionals, we need to strike a balance between being active, professional and human. It is a hard balance to strike, but not impossible. Thanks for being a listener. Nice to see we have reached Ohio! Next → Next post: From Journalism to PR: Episode #3 – What is in a PR title?